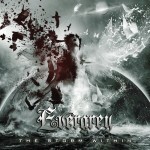 Share the post "Album review: EVERGREY – The Storm Within"
Evergrey very nearly called it a day a few years back but they regrouped with drummer Jonas Ekdahl and guitarist Henrik Danhage rejoining the band. 2014′s ‘Hymns For The Broken’ was a real return to form and they are back with this new album, their second since signing with AFM Records. It is also the band’s tenth studio album and their twentieth anniversary. On this album mainman Tom S Englund tackles having someone, losing them, and having to pick yourself up and move on. Englund is one of the better metal lyricists out there, never afraid to tackle contentious subjects or very emotive ones, the latter is very evident on this album. Take ‘The Paradox of the Flame’, a moving slow burner helped by having Englund’s wife Carina duet with him. A departure for the band as well as it features a mournful violin on the outro. Not to be outdone Nightwish’s Floor Jansen duets on ‘In Orbit’, a song which has the Evergrey staccato guitar riffs in full flow – one of the many things I love about this band’s sound. The album has a mellower feel in many parts and ‘Disconnect’ throws everything into the mix from its heavy start, through to a choral passage and some wonderful guitar solos. The title track is similar, relying on atmospheric keys and guitars to create a mellower song, yet still as powerful in delivery as their heavier songs. Speaking of the band’s heavier side, the lead song ‘The Distance’ gets the old adrenaline pumping, and ‘Passing Through’ features some very modern synth sounds, marking another little musical adventure for the band. This entry was posted in ALBUM REVIEWS, ALBUM REVIEWS (Mobile), All Posts and tagged album, Evergrey, Floor Jansen, progressive, progressive metal, review, the Storm Within, Tom S Englund. Bookmark the permalink.